"The Joy of Melt and Pour Soap Crafting" is for anyone who wants to make soap without lye. 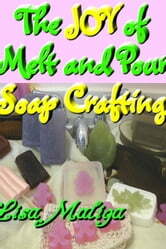 You can make handcrafted soap in less than one hour and this book will show you how! Step-by-step instructions are included along with information about equipment, colorants and creative labeling and packaging. The book has 40 recipes with accompanying color photos, a section on fragrance and essential oils, melt and pour soap secrets, and a list of reputable suppliers. Written by the author of "How to Make Handmade Shampoo Bars" and "12 Easy Melt and Pour Soap Recipes."